Five online satellite winners from Intertops Poker and Juicy Stakes Casino are on their way to the Caribbean to compete in the $250,000 GTD WSOPC St Maarten Main Event this week. They each took down an online satellite aand won a $4500 prize package that includes the $1700 Main Event buy-in and luxury accommodation at the Sonesta Maho resort. Five online satellite winners from Intertops Poker and Juicy Stakes Casino are on their way to the Caribbean to compete in the $250,000 GTD WSOPC St Maarten Main Event this week. They each took down an online satellite aand won a $4500 prize package that includes the $1700 Main Event buy-in. “I played a $2 rebuy to win a seat into the $110 satellite where I won this trip!” said Phil who also won his way to Punta Cana at Juicy Stakes Casino three years ago. “I’m bring my girlfriend with me so she can relax at the beach and pool while I’m in the casino, hopefully getting my first Hendon Mob listing!” said Lukas, who also won his way to the Malta Poker Festival this year. 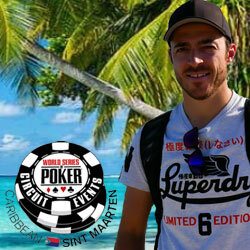 The WSOPC St Maarten, now in its fourth year, is a well-run tournament produced by TK Poker. It attracts all kinds of players – professionals, semi-professionals, and recreational – from all over the world. This Saturday is the next $600 GTD Bounty Run Tournament. Players are paid a $2 bounty for every player they knock out. Details are available at Intertops Poker Bounty Run Tournaments and Juicy Stakes Casino Bounty Run Tournaments.